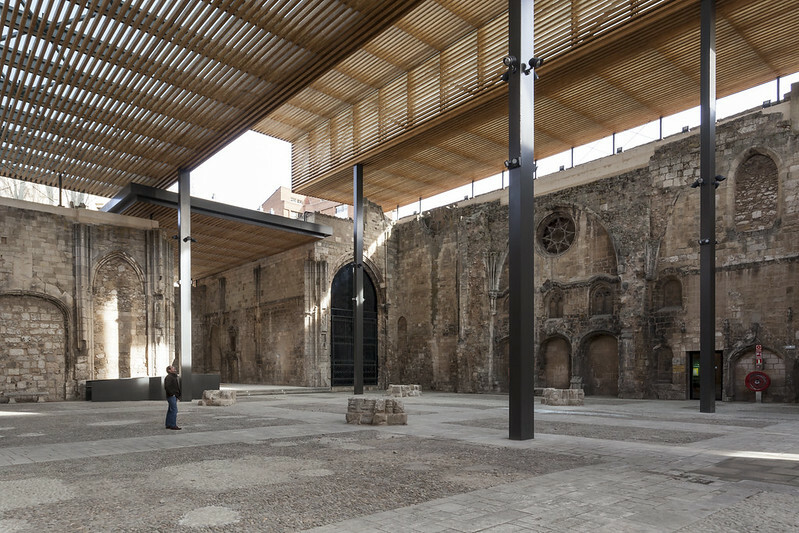 This original project sought to elegantly preserve an important monument in the city of Burgos in the north of Spain. Built in the 11th century, much of the church suffered damage due to two successive fires in the 15th and 16th centuries respectively as well as during conflict in the 18th century. The church’s structure is now largely in ruins, though the exterior sidewalls and some Gothic elements have survived. Thanks to conservation efforts in the latter half of the 20th-century, the ruin, though exposed was in relatively good condition. The monastery and its adjoining buildings, an addition from the 19th-century, is now home to the Marceliano Santamaría museum who had converted the ruin into an open-air space for hosting events and various celebrations. The addition of this well designed roof was conceived as a way to effectively preserve the ruin, to enhance the surviving elements of the architecture and to create a new protected space to celebrate cultural activities regardless of weather conditions. Prior to beginning any major design or construction work, a comprehensive archaeological study was undertaken to map the history of the Monastery and to analyse the strength and stability of the structure. The results of this study were used in drafting designs calculated by specialised engineers, ensuring that the project was carried out with complete respect for this history and that the solution was thoroughly bespoke. The project was coordinated by the Burgos City Council and was made possible thanks to European Union Urban Development funds. “This project has presented an innovative approach to reusing and repurposing an important ruin and it has revitalised the space for use by the wider community through the Museum’s public and private events”, affirmed the jury. “This high-quality work is of an elegant design and does not in any way attempt to replicate anything which has come before. The solution is non-invasive yet offers effective protection of the natural condition of the ruin. The intervention is completely discernible from the old fabric and is totally reversible, an important factor to always consider in making new additions to ancient ruins” noted the jury.